Wilson's Phalaropes are cool looking birds and they don't seem too afraid of people and allow one to get fairly close. 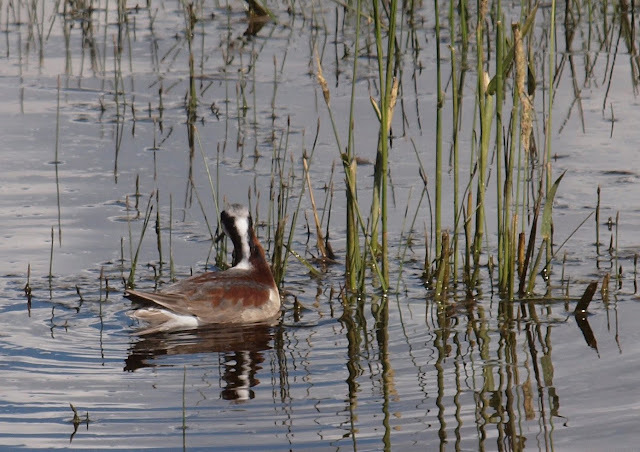 I have seen them in reservoirs, but most often in flooded pasture lands as pictured. All of my Idaho and Oregon sightings have been in the months of May through July and they seem fairly common during these months in suitable habitat. They are fun to watch. I've seen them swimming in mad circles in a discombobulated swarm of a couple dozen, or individually gently preening themselves. This is an example of a bird, like humans, where the females are prettier than the males. Wikipedia has an interesting note: the males incubate and tend the young as the females migrate once they lay the eggs. In flight, for the inexperienced like me, they can be hard to figure out. My father-in-law and I once studied a flying shorebird as it circled over us in the air near Danner, Oregon. For the life of us, we couldn't figure it out for a half an hour, while the whole time it kept flying round and round. Finally, we got to the Phalarope section in our Sibley guides and realized what it was we were seeing. The picture below was simply to point out what the back of the head and neck look like with the black and white constrasting stripes. 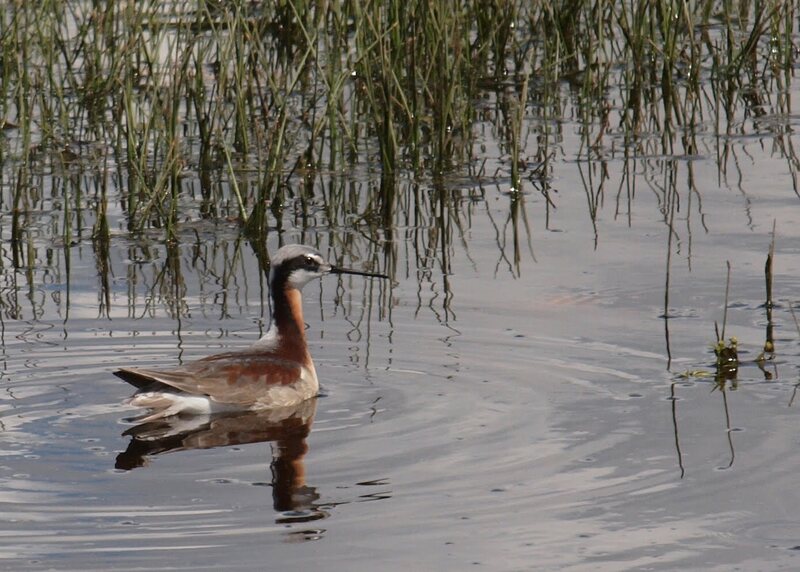 Great photos of the Wilson's Phalarope!